NASA has started low-speed wind tunnel testing of a subscale model of its X-59 low-boom supersonic demonstrator. The X-59, which will be built by Lockheed Martin, could pave the way for supersonic flight over land in the U.S., if the agency can prove that the X-59’s “sonic thump” isn’t a noise nuisance to people on the ground. 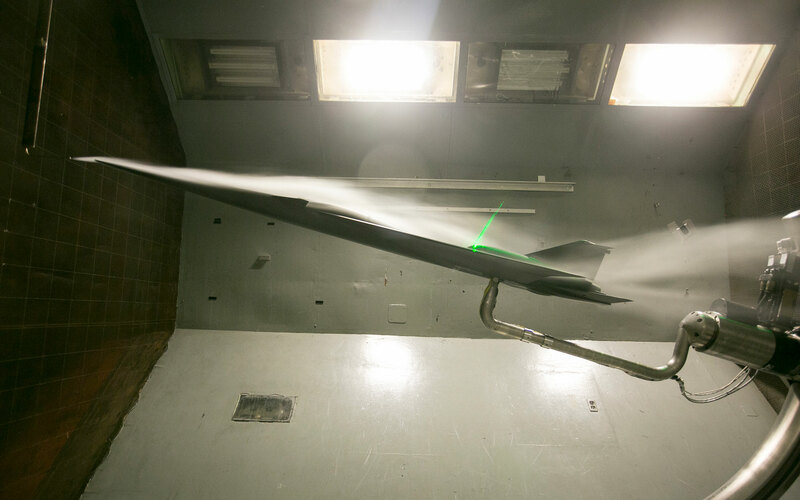 The recent tests, conducted at NASA Langley, collected low-speed aerodynamic stability and control data to expand upon previous experimental and computational predictions. They consisted of three phases: static stability and control tests, dynamic forced oscillation tests, and flow visualization tests using laser techniques. Once deemed safe to fly, the X-59 will begin making supersonic flights over "select communities" in 2023 to measure residents’ reactions to any noise they might hear. On this front, NASA yesterday started trials of an F/A-18 supersonic research aircraft off the coast of Texas near Galveston to test ways to measure the community’s response. The research airplane is flying a unique maneuver that creates a quieter “thump.” Capturing how people and sensors on the ground respond to that sound is the goal for this Quiet Supersonic Flights 2018 campaign.